With new high end phones coming in almost everyday, the low end phones get lost in translation but Samsung has done a great job putting the [email protected] on forefront including pushing it on ad during African Cup of Nations matches. So what it is with [email protected] ? I start with price because i have realized that it is one element that most Kenyans look for online. [email protected] retails at Ksh.7000 but it can be either higher or lower depending on where you are getting it from within town. Samsung’s [email protected] comes with DUOS ,so users can access dual SIM cards for more convenient calling, savings and network coverage. Listen to your favourite tunes without needing a separate music player! It comes with a 3.5mm ear jack , you can use your favourite earphones without needing an adaptor. And with Samsung Apps, you can download a variety of entertaining apps from fun games to lifestyle apps to fill up your free time! Samsung’s [email protected] lets you keep in touch with friends, family and business associates through popular social networking methods (Facebook, Twitter), instant messaging programs, and email – all on the go via your mobile phone. Email accounts can be set up easily so you check for urgent email without needing a PC. –FM Radio with FM Recording. 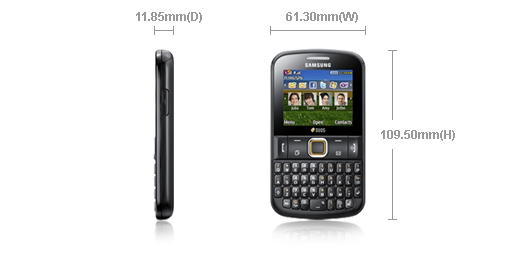 –Battery: 1000 mAh, Up to 710 minutes, standby upto 550 hours.